Vic Reeves and Bob Mortimer seem to have revived a moribund career with a commission for a new six-part sitcom series with the BBC. After their emergence on Channel 4 with Vic Reeves's Big Night Out in the early 1990s, their career took a circuitous route. 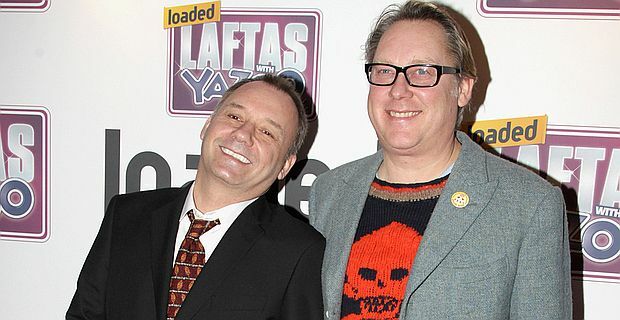 Vic and Bob's recent exposure has been limited to the sporadic revival of their chaotic celeb-driven gameshow Shooting Stars. House of Fools takes a conventional comedy situation, an Odd Couple style flatshare and puts it through the Reeves and Mortimer surrealism filter. "Just as they bent the rules of the panel show format, House of Fools does the same to the studio sitcom," a BBC statement promised. The set up is that Vic is a lodger in Bob's grubby flat, where they play host to a cast of regular visitors, including ladies' man Beef, Geordie convict Bosh and predatory neighbour Julie, no doubt bearing a host of catch-phrases. In true Reeves and Mortimer style, the set-up is the loosest of frameworks for their scattergun humour. "It's half an hour of unadulterated Reeves and Mortimer, uniquely surreal jokes, physical nonsense, daft songs, unimaginable props and impossible situations, with a comedy thoroughbred cast," the BBC summary adds. The duo's previous attempts at sitcom have not been entirely successful, with Reeves's recent part in Hebburn failing to drag the series above the level of mediocrity. BBC comedy chief Shane Allen is confident about his commission. "Vic and Bob are the daddies of daft comedy and it's a total joy to watch two men in their 50s goof about so gloriously," he said. "I'm extremely proud to bring them back to the BBC in this hilarious reincarnation." "We're back where we belong," the duo said. "We're over the moon to be making a series of House of Fools for the BBC."